President Bush risked further fueling a testy dispute with Russia over a new U.S. missile defense system on Tuesday, saying that Moscow has "derailed" once-promising democratic reforms. In a speech celebrating democracy's progress around the globe — and calling out places where its reach is either incomplete or lacking — Mr. Bush said that free societies emerge "at different speeds in different places" and have to reflect local customs. But he said certain values are universal to all democracies, and rapped several countries for not embracing them. "In Russia, reforms that once promised to empower citizens have been derailed, with troubling implications for democratic development," Mr. Bush said, speaking at a democracy conference in Prague organized by former dissidents. The president asserted that this discussion of democratic backsliding in Russia under the leadership of President Vladimir Putin was just one part of a strong relationship. "America can maintain a friendship and push a nation toward democracy at the same time," he said. Speaking only hours earlier at a joint news conference with his Czech counterpart, Mr. Bush took a more conciliatory tone on the contentious relationship with Moscow, saying Russia is not an enemy of the United States, and has nothing to fear from the proposed missile defense system. "Russia is not the enemy," Mr. Bush said after meeting with top Czech leaders in a visit en route to the G-8 summit in Germany. He said he would take a message to Russian President Vladimir Putin that "we can work together on common threats." The Kremlin is bitterly opposed to the missile shield, and Putin warned on Monday that Russia could take "retaliatory steps" if Washington insists on building it. 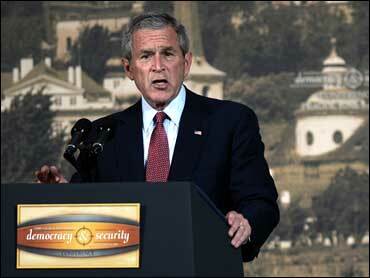 Mr. Bush's speech on democracy was part of his "freedom agenda". But the far more important theme was his appeal to Putin to tone down his fierce rhetorical opposition to the defense plan. Mr. Bush beseeched Putin in his earlier remarks to join in the plan, suggesting he send Russian generals to inspect the proposed sites. The president said, off-handedly addressing his Russian counterpart via the television waves; "As a matter of fact, why don't you cooperate with us on a missile defense system?" The president arrived Monday evening in Prague for a day of meetings with Czech leaders. CBS News senior White House correspondent Bill Plante reports the missile defense standoff has set back American relations with Moscow like nothing else in years. But Russia is not alone in disliking the idea of constructing missile and radar installations in the Czech Republic and other countries on its doorstep. Most Czechs aren't happy about the proposal, either. Recent polls in the former Soviet satellite, now a democratic NATO ally, show more than 60 percent of the public in opposition. The international debate over the missile defense system likely will drown out everything else during Mr. Bush's stay in Prague. The U.S. plan calls for an anti-missile radar base to be built at the Brdy military zone southwest of the capital. Plante reports that no matter how much Mr. Bush tells Putin the defense system is not aimed at Russia, Russia is likely to believe that it is. Russian-European affairs expert Leon Aron tells CBS News that President Putin's tough stance on the missile defense plans may have more to do with domestic politics than dredged up Cold War sentiment. Aron explains that Putin is nearing the end of his presidency, and "it's at this time that the man in charge needs to show that he's not afraid of anybody… that he is in charge and he is strong enough to challenge the West." Mr. Bush's national security adviser, Stephen Hadley, however, called Putin's rhetoric "not helpful." Putin's latest comments come on the heals of an invite from Mr. Bush to meet in Washington in July, to discuss the missile defense plans and other issues of contention, reports CBS News White House correspondent Jim Axelrod. But that confrontation will likely come much sooner now, with Mr. Bush scheduled to meet Putin in two days in Germany on the sidelines of the upcoming Group of Eight summit. Hadley, the president, and other U.S. officials have sought to cool down the situation — to no avail. They insist the network is meant to protect NATO allies against a missile launch from Iran, not Russia. Despite its conciliatory tone, President Bush's initial comments in Prague could be overshadowed by the later statement on Russia's slow progress on democratic reform. With the Iraq war raging and that country in disarray, some criticized Mr. Bush's effort to refocus attention on his "freedom agenda" — the byproduct of the president's promise to predicate U.S. relations with all nations on their treatment of their citizens and to advance democracy in every corner of the globe. Mr. Bush claimed the mantle of democratic warrior. "I pledged America to the ultimate goal of ending tyranny in our world," he said. "Some have said that qualifies me as a dissident president. If standing for liberty in the world makes me a dissident, then I'll wear the title with pride." Mr. Bush's message is typically better received in small, newer democracies. The Czech Republic, for instance, has deployed troops to help support the U.S.-led campaigns in Iraq and Afghanistan. The president was invited to make the speech as part of a conference on democracy hosted by Natan Sharansky, a former prisoner of the Soviet regime who has continued to champion freedom, and former Czech President Vaclav Havel, who led the Velvet Revolution that ended communism in the former Czechoslovakia in 1989. The president also plans to meet with current and former dissidents from around the world. From Prague, Mr. Bush was to travel to Germany's Baltic Sea resort town of Heiligendamm for three days of meetings between the leaders of the world's eight major industrialized democracies. The rest of his eight-day European trip was to include a stop in Poland — also a proposed site for part of the missile defense system — as well as visits to Italy, Albania and Bulgaria.